Twelve months, twelve different preserves, many new friends, and lots of amazing recipes later, we are nearing the end of Tigress' Can Jam. Thank you, Tigress, for all of your hard work and excitement, which allowed us to revisit the classic preserves of our family histories, and gave us courage and inspiration to test out new ingredients. This month's ingredient, dried fruit of any kind... My first thought was to try to make a sticky toffee pudding-like jam that I could preserve! After quite a bit of research, I couldn't come up with a recipe that I was comfortable enough to can safely. My wife suggested trying mincemeat. Every holiday, we make a conscious effort to make as much of our meals as possible ourselves, as local as we can. But my father-in-law always buys terrible, chemical-tasting mincemeat tarts. We knew that we could definitely make ‘better than grocery store-bought’ tarts. And, if we could make them, we would be able to tweak them until we actually like mincemeat! Many traditional mincemeat recipes we found called for using suet, this just didn't appeal to us. We wanted to capture the flavor of mincemeat, without the meat. Funny, since we typically add homemade bacon to almost everything! 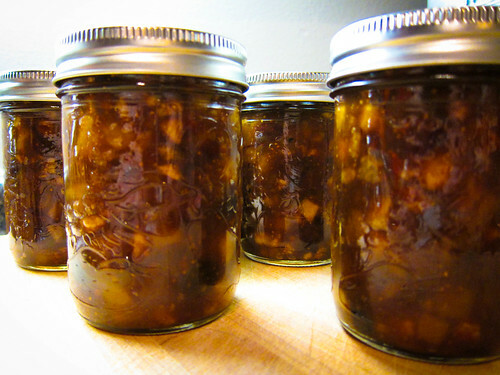 Still remaining skeptical that we would like mincemeat, I found a recipe for a dried fruit and nut conserve in Topp and Howard's, Small Batch Preserving. I wanted to add some more dimension, so I added dried apricots and dried figs, and then adjusted the measurements of all of the dried fruits. We found that the mixture also lacked in liquid so we increased the amount of apple juice. The end result? We really, really liked it! The texture retains some crunch from the pears and apples and the dried adds a concentrated depth of flavor. I am excited to make my own pastry and introduce my father-in-law to a new version of his favorite holiday treat. We hope he likes it as much as he likes our marmalade – every time he sees us, he returns an empty jar to be replaced with a full one! Nothing beats the feeling of someone loving what we have carefully chosen to preserve this year. Thanks again, Tigress, for such a fantastic experience. 1 – Place apples, pears, dates, figs, raisins, cranberries and apple juice in a stainless steel saucepan. Bring to a full boil over high heat, cover, reduce heat and boil gently for 10 minutes or until fruit is tender, stirring occasionally. 2 – Stir in sugar and lemon juice. Return to a boil, reduce heat and boil gently, uncovered, until mixture forms a light gel, about 10 minutes, stirring frequently. 3 – Remove from heat and stir in pecans and spices. 4 – Ladle into hot jars and process for ten minutes. I recently came across this recipe in the same book, and after some online research, decided to make it incorporating your modifications. It's my first time making a conserve, and I was wondering...does it need to age (or get better with age), or can it be eaten immediately? Thanks! We ate ours right away and it was great. We also made some tarts with ours a few weeks later and the flavors all melded together a bit more. I really love this recipe; I've done several batches (though without the pears). It is both delicious and simple. Also, it won me a ribbon at the Royal Agricultural Winter Fair. Thanks so much Sarah, I'm so glad you enjoyed it!